How Do I Track Specific Skills My Student Needs to Work On? How Do Homeschoolers Assess Standards and/or Specific Skills? Kiddom allows you to add specific skills and track student progress on them easily. Customize Kiddom so your student can receive feedback on academic and developmental skills. Kiddom gives you the ability to create custom standards. You can create custom standards to track progress on each individual skill. You can add multiple custom standards to a single assignment. To learn how to create custom standards, click here. Multi-subject classes provide teachers the ability to align standards across multiple subject areas. If teachers assign an informational science text, they can align the assignment to ELA standards for informational reading, as well as science standards for content. 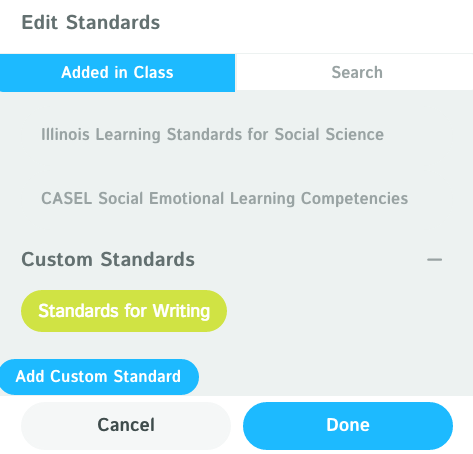 Once graded, these skills are tracked with reports located on the Class Mastery and Student Mastery pages, as well as your student progress reports. To learn more about multi-subject classrooms, click here.